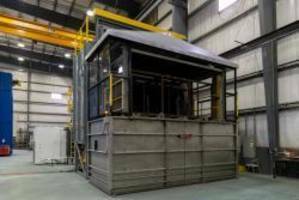 Wisconsin Oven Corporation announced the shipment of a LP Gas Fired Heavy Duty Car Bottom Oven with Fume Incinerator to a leader in the oil and gas industry. This car bottom oven will be used for prebaking drill pipe joints. 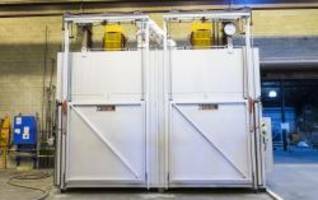 The thermal clean oven has a maximum operating temperature of 800° F and work chamber dimensions of 8'6" wide x 50'0" long x 8'6" high. Guaranteed temperature uniformity of ±30° F at 750° F was verified through a twenty (20) point profile test conducted in an empty oven chamber under static operating conditions. 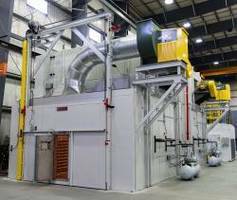 The industrial oven has sufficient capability to heat 70,000 pounds of steel from a cold start to 750° F within 75 minutes. 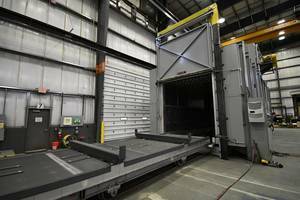 The load car is designed for a maximum loading of 172,000 pounds. 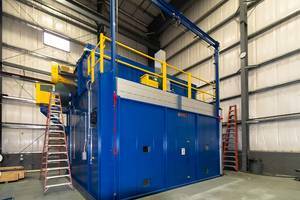 The fume incinerator is designed to incinerate the exhaust fumes from the oven and has sufficient capacity to handle 5,000 CFM of exhaust. 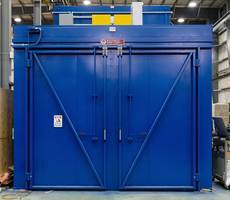 This heat treating oven was fully factory tested and adjusted prior to shipment from our facility. All safety interlocks are checked for proper operation and the equipment is operated at the normal and maximum operating temperatures. An extensive quality assurance check list was completed to ensure the equipment met all Wisconsin Oven quality standards.